Scott Parker came up with a winner deep into stoppage time to spare West Ham Carling Cup humiliation. Parker smashed home Frederic Piquionne's cross but the timing was harsh on the visitors who had been stubborn and organised throughout and at least deserved a crack at the Hammers in extra time. But while West ham manager Avram Grant will be thankful to have avoided a cup giant-killing this performance only laid bare the size of his task at Upton Park. West Ham are point-less after two games this season in the Premier League and they are struggling for fire power. Their next two games are against Manchester United and Chelsea and on this showing more humiliation could be in store. The truth is the result was harsh on Oxford who for long periods of this match matched their top-flight opponents, so much so that it was difficult to determine who were the big-time team. It was the same old story from West Ham. Lots of neat passing and fluid movement but no real penetration. They had made six changes from the team which lost to Bolton at the weekend. Marek Stech took over from Robert Green in goal and defender Tal Ben Haim, on loan from Portsmouth and once of Chelsea, was handed his debut. 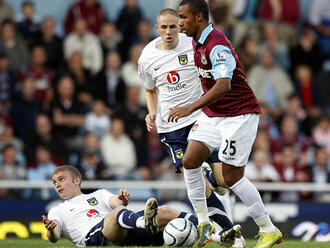 Scott Parker and Mark Noble, however, were retained in midfield and they ensured that the Hammers had most of the possession. But it is one thing passing the ball about in pretty patterns, quite another doing it with penetration. Piquionne was one of the culprits. He might have put the Hammers in front in the first minute but his rasping 20-yard shot was neatly turned around the post for a corner by Oxford goalkeeper Ryan Clarke. But it was the header he missed from six yards and when under no pressure with just the goalkeeper to beat which summed up West Ham's problems. Not direct enough. Too little fire power. The first half was all huff and puff and no end product, unless we count the boos which rained down on the team at half-time. It could have been worse because Oxford had their chances. Alfie Potter, who once scored for Havant and Waterlooville against Liverpool at Anfield in an FA Cup fourth round tie, was a scampering menace, firing in a 25-yard shot which stung the hands of Stech. Captain James Constable and Asa Hall, the latter with a blistering 30-yard drive, also brought sharp saves from the West Ham goalkeeper in the first half. The second half was much of the same, West Ham driving forward but too often without conviction or creativity. Grant was forced to throw on Carlton Cole for Junior Stanislas in the 62nd minute in a bid to give his side more fire power. But take nothing away from Oxford. They were magnificent when you consider that they had spent four seasons in the Conference, had battled financial problems and only returned to the Football League in May. They have a healthy future in front of them if this is anything to go by. They might have produced a heroic result if shots from Hall and Potter had been more precise but as it was they were stung by a late, late show from Parker. West Ham Stech, Faubert, Tomkins, Spector, Ben-Haim, Barrera,Parker, Noble, Stanislas (Cole 62), Sears (McCarthy 78),Piquionne. Subs Not Used: Green, Boa Morte, Kovac, da Costa, Ilunga. Oxford Utd Clarke, Purkiss, Wright, Worley, Tonkin, Hall,Bulman (Baker 70), Heslop, Potter (Green 86), Constable,Cole (Clist 46). Subs Not Used: Eastwood, Creighton, Midson, Deering.